16 in. x 24 in. 30 in. x 48 in. U.S. Yacht Ensign looks like the national flag and ensign but with a fouled anchor in a circle of stars in the canton blue area. 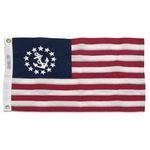 In August of 1848 by Act of Congress the flag (ensign) began the used by licensed U.S. yachts.